Never underestimate the power of a child’s note! April 24, 2015 1:00 am / 2 Comments on Never underestimate the power of a child’s note! Never underestimate children and the impact they can have! On April 14th we received an unexpected envelope. According to the postal mark on the envelope, it was sent first class from Wausau, Wisconsin on March 11th (yes, the mail system here can be quite abysmal). As we opened the envelope and removed the contents, we started reading through 7 colorful handmade cards from about 23 children. It was touching to see the artistry of these children and to read their simple messages of encouragement. Their messages to people they do not know (and may never meet) were sweet, uplifting and encouraging. What impacted us the most is the fact that the church where these children attend is a church we are not associated with. We visited there once about 10 years ago when we were in Wausau visiting a friend. 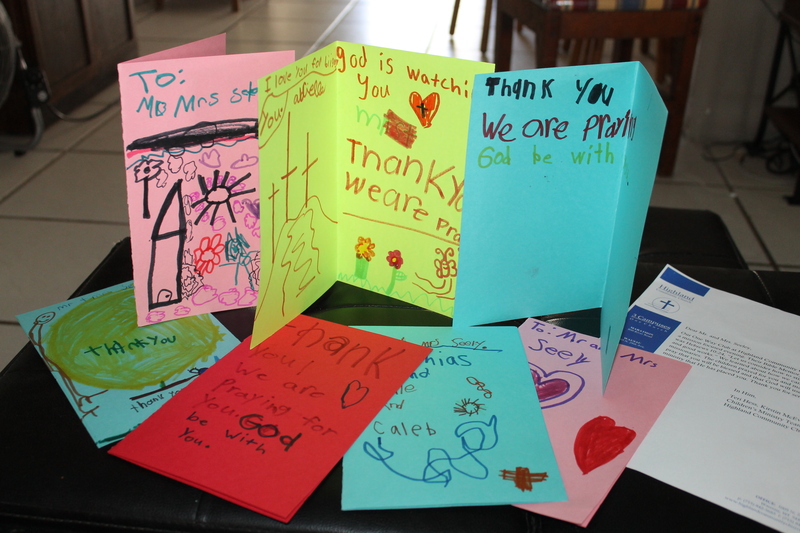 As I contemplated how to honor these little encouragers for the great “work” they had done by sending us these cards, I reflected back to my childhood and the many notes I had written to missionaries for Sunday School or VBS class projects. As I pondered on this, I told Tim and Zachary we need to write back to these children. I don’t ever recall getting a note back from a missionary that I had written to as a child. I want these children to know how encouraging they are and how their simple act has benefitted the ministry here. So please write to us if you can. We would love to hear from you! With that, please understand, we will do the best we can to respond in a timely manner. Facilitator Staff Needed for 2015-16! Facilitator Sam will be leaving us soon. It is hard to believe we are approaching the end of another school year. That means, 2 of our current facilitator staff who made a commitment to work as facilitators at the Centre for the school year, will be leaving the island to go back to the States. With their vacancy comes a need to replace them. We are also looking for someone to work as a maintenance assistant. If you are interested or know someone who would be interested in filling these positions, please contact us. Please pray God sends the right people to help us in the work we are doing here at Adventure Learning Centre and Camp. Bob and Faye left on March 25th and safely made it home to London, Ontario, Canada. We sure miss them but look forward to their return next winter, which will be here as soon as you know it. We have a hard time saying good-bye to these two every year. Saying good-bye to ALC staff. Saying good-bye to their home away from home. Lunch with these gals is always a highlight. It is like having lunch with two moms. Bob’s pet project: keeping the ALC train going. The board has given approval for the construction of a new cabin and the relocation of the front entrance to the Camp. We are waiting for blue print/plan modifications for the cabin. Please pray that plans get finalized and that God sends the right people and funds for constructing the cabin. With the breaking down of our current generator, we have been approached by someone who is offering to help partially finance the acquisition of a couple of generators for Camp. One will be to power the dining hall/part of the bathhouse to maintain essential power to serve guest groups, and one will be to power the Camp house and office which will keep phone, water and internet service functioning during times of power outages. Please pray for the decisions that need to be made regarding type, size and placement of the generator(s), and pray that God supplies the funds for them. If you follow us on Facebook (The Seeley Family Serving in the Bahamas), you may have noticed we had bush fires in the areas immediately surrounding Camp property. Bahamas has a policy that they will only answer fire calls that threaten structures. They are not concerned with fires in the bush. We, however, are concerned about the fire in the bush because a fire in the bush can easily enter Camp property and threaten the serene, secluded-feeling beauty of Camp as well as the buildings on site. The staff took time over 5 days doing round the clock vigils watching for flare-ups, and several of us spent time in the bush with Indian fire packs extinguishing flare-ups. So proud of these guys and the other staff who fought the fires for 4 days straight! Tim and Deborah Lamm and six other adults from Peace Church in Wilson, NC were on the island to serve at All Saints Camp the last week in March. They had dinner at our house on Monday evening followed by a tour of the Centre. 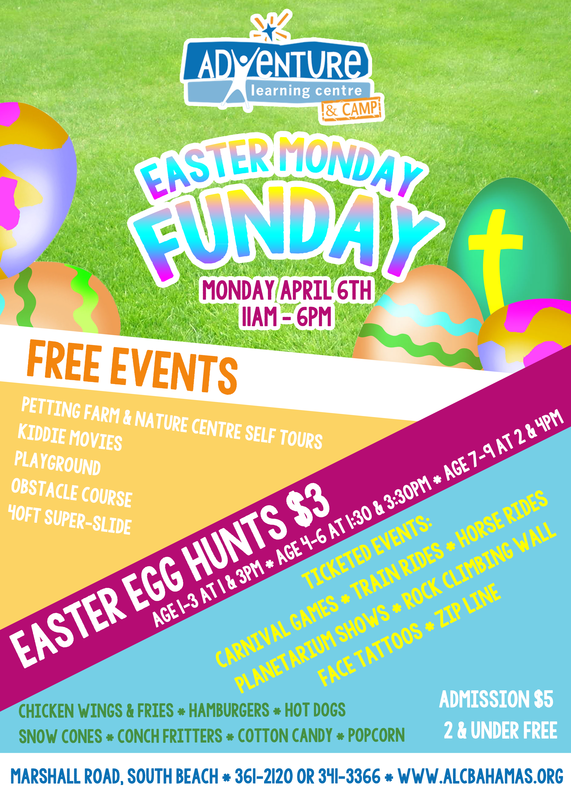 Twice a year, we have fundraisers to help support the ministry work of the Adventure Learning Centre and Camp. The Christmas Lights Drive-thru was in December, and the Monday following Easter Sunday, we had the annual Easter Monday Funday. Even though many of us were busy fighting fires the week before the Funday and were not able to assist in preparations, the attendance at the Funday was a record breaking +1550, not counting volunteers and children under 2 years old. God surely blessed us with great weather, great turn out, and great fund raising. I was the photographer for the day. Before the day began, Mark shared from God’s Word. After prayer, Dilan led the day with instructions. Ms. Ada’s birthday was the same day as the Funday. Megan ran the Easter Egg hunt. Sam led the climbing wall. This team was led by team member Kim Shortell, and they served Bahamian children at Bilney Lane and Ranfurly Home and served a day at All Saints Camp. The pastor of the church is married to a Bahamian woman and enjoyed getting to see his in-laws while he was here on the island. We are looking forward to hosting a local young lady’s group this weekend at Camp. Also this weekend we will be hosting a young adult leadership meeting at our house on Saturday morning, our church’s annual picnic at Camp on Sunday, and a Youth Outreach meeting Sunday evening. A busy weekend for sure! A week from Sunday, we welcome back to the island the students from Florida Atlantic University. The group has been here for a week the last two Decembers. They will be serving at the hospital, Bahamas Association of Physically Disabled and doing hypertension and blood glucose screenings at the mall. We are excited they are coming back. As you can tell, we remain quite busy. We are so grateful for a staff that are not only great to fellowship with regularly but are also a huge help in sharing the work load here at ALCamp. We invite you to check out our last 2 blogs (link: “A Time for Everything” and “Foreign Missions: Is it really a sacrifice?”). Could you please check out our prayer requests and pray for us? We could really use the prayer. Please check back later. We do not have time to update the pictures at this time. Thank you for taking the time to catch up on what has been going on these past few weeks. We look forward to hearing from you. We are not employed by Adventure Learning Centre and Camp. The work we do here in the Bahamas is exclusively funded by the generous support of individuals and churches. If you feel led to do so, you may partner with us and support our ministry work by clicking on the “Shepherds Staff Mission Facilitators” logo in the side bar of this page and following the instructions. All donations are tax deductible. Thank you for your prayers and generosity. May God bless you!